These photos of a recent ‘run-off’ accident near Greville St.
← What Council items cost ! Another option would be to install a red-light speed (safety) camera at the traffic light at the corner of Fullers Road and Greville St. If the RMS is still refusing to install speed cameras anywhere in NSW, an alternative is the red-light speed (safety) camera which they have continued installing throughout NSW. (Ed. Speed cameras are installed by the Office of Public Safety, not the RMS). I believe this would prevent a lot of accidents and also slow people down around the corner. I live at 106 Fullers Road and my neighbours and I frequently meet out the front of our houses to see the carnage following accidents outside our houses between Millwood Ave and Greville St. 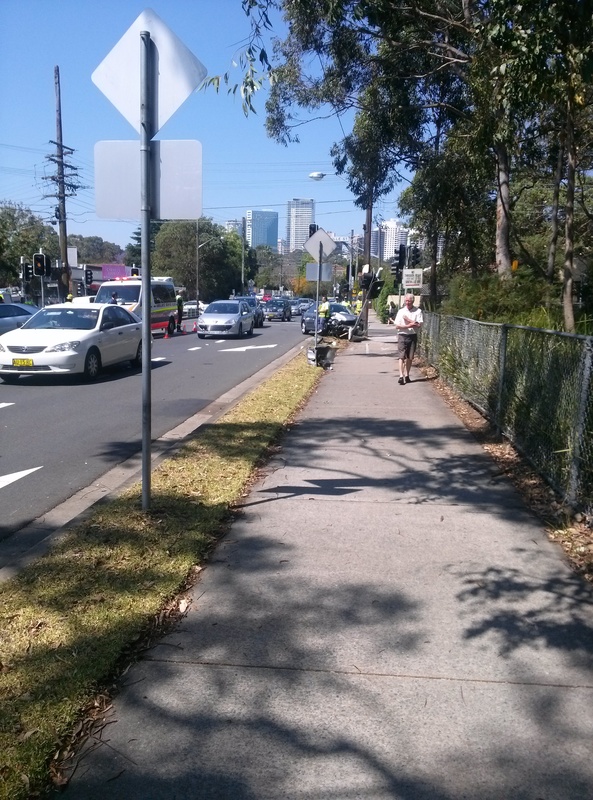 I believe a safety camera at Greville St would have prevented an accident occurring at approximately 1:45pm on the 19th October 2013 where I suspect a west-bound car was going through the amber light along Fullers Road from the left lane. A car coming from Ryde wanted to turn right into Greville St and didn’t see the west-bound car causing a collision and damage to the traffic light and disruption to traffic.